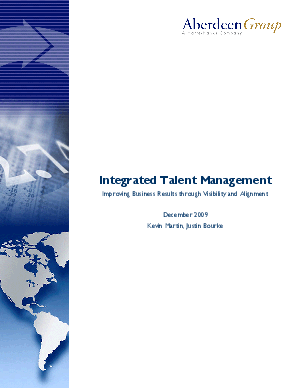 Integrated Talent Management: Improving Business Results through Visibility and Alignment: The key to organic organizational growth in 2010 will be the proper alignment of the workforce with a company's near- and longer-term goals. As a result, 2010 will be a year in which nearly three-quarters of organizations will increase emphasis on talent management. At least, that's according to surveys conducted by Aberdeen Group of 349 human resources and line of business executives during the months of November and December 2009. To achieve this desired alignment, organizations are integrating formerly disparate talent management processes, systems, and data. While our research shows the vast majority of organizations have only achieved integration across two or more elements of talent management, those that have are reporting superior performance gains.